Widely regarded as one of the top five best wedding photography studios in the United States, Couture Bridal Photography offers the top wedding photography throughout South Florida and is internationally known as the top Puerto Rico destination wedding photography studio. We are a team of professional award winning wedding photographers specializing in wedding photography throughout Puerto Rico's most popular resorts, venues and locations. We are a boutique wedding photography studio based in Fort Lauderdale, Florida serving the continental United States and specializing in Puerto Rico destination wedding photography assignments. As the most sought out wedding photography studio for Puerto Rico weddings, we have built a reputation as the prime wedding photographers for any wedding in Puerto Rico. Our Unique style of documentary style of wedding photography with a fashion forward illustrative flair that brides love and book us immediately for their wedding photography. We are regarded as the number one wedding photography studio with photographer that specialize in elegant, romantic and timeless wedding photography. We are considered internationally as a fine art wedding photography studio and have received international acclaim with awards for our carefully captured and edited wedding photography images from weddings throughout the United States, Florida and Puerto Rico. Couture Bridal Photography is the most selected Puerto Rico destination wedding photographer for wedding with ceremonies at Cathedral of San Juan Bautista for the elegant and spectacular photographs taken there from past weddings. 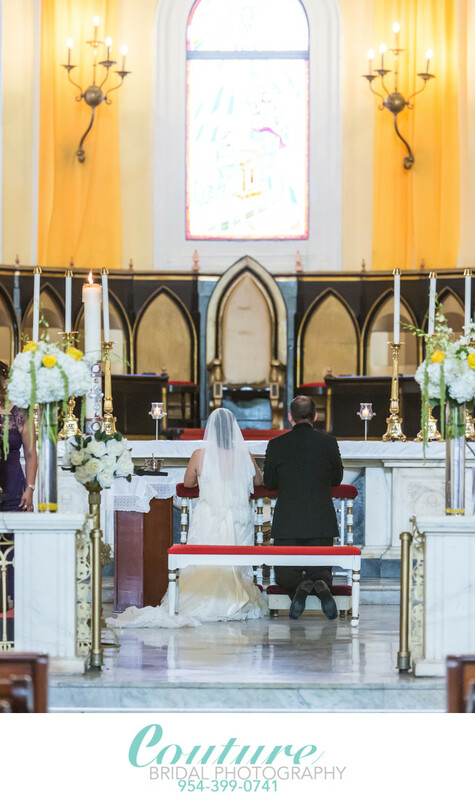 Call and book the best Puerto Rico destination wedding photography studio for any wedding with a ceremony at Cathedral of San Juan Bautista now. Couture Bridal Photography offers special low rates for weddings booked a year of more in advance with big savings. Location: 151 Calle del Cristo, San Juan, 00902, Puerto Rico. 1/160; f/3.2; ISO 4000; 145.0 mm.